An incomplete Iron Age inscribed silver unit of the Eastern Anglian region / Iceni, dating to c.AD 10-43, 'Ecen Trefoil' type. Obverse: Double opposed crescents on vertical wreath. 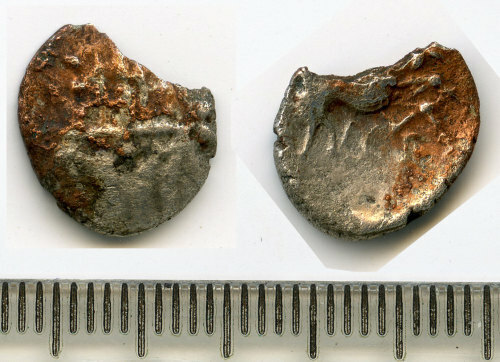 Reverse: Horse right with double upper front legs, solid Y-shaped head, trefoil on shoulder, pelletal sun above, S below head, and ECE below. As ABC p. 89, no. 1666; BMC 4431-4444. Obverse description: Double opposed crescents on vertical wreath.